So, like much of America, I'm trying to understand what the heck happened with General Petraeus, the woman in North Carolina he apparently was having an affair with, the woman in Florida he allegedly wasn't, the FBI agent who sent shirtless pictures to the woman in Florida, etc., etc. 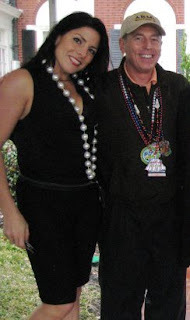 So does this picture of Petraeus with his arm around Jill Kelley, the woman in Florida, mean anything? It might, if it were a picture of him and Jill Kelley. Instead, it's a picture of him with his arm around Natalie Khawam, Jill Kelley's identical twin sister. They look nothing alike. To me. This story is so strange. It's like a Cohen brothers movie or something.